What we have here, is an Andex Chart. An Andex Chart shows a history of the more common types of investments available to consumers. Andex charts are extremely important to consider when investing because it shows the history of the different types of investments dating back to 1950. The Andex chart also shows other interesting events, such as when Canada or/and the U.S. was in a recession. Looking at the image to the immediate right, the white background (under the G in GST starts) represents the Americans being in a recession for that particular year, the medium grey represents when Canada was in a recession also for that particular year (Years are on the top and bottom of the chart) and the darker grey represents both Canada and the United States being in a recession. Now that you know a little bit about an Andex chart, let's get into the more important things on an Andex chart. The lines going from left to right. 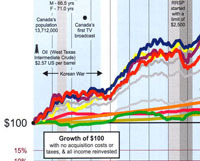 These lines represent what would happen if you invested $100 in 1950 and left it in your investment account. 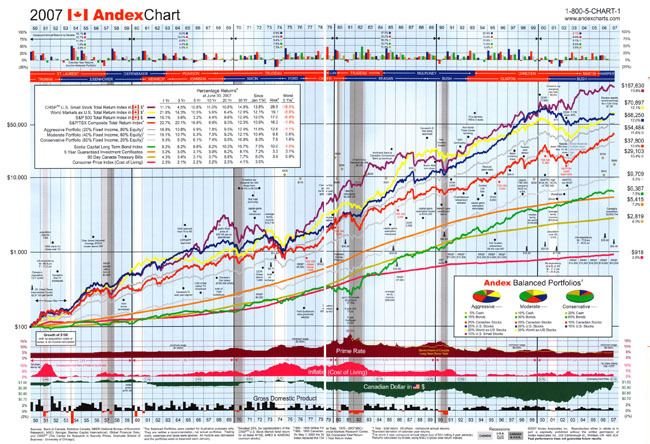 The orange line on an andex chart shows 5 year GIC's (Guaranteed Investment Certificates). The red line tracks the Toronto Stock Exchange or TSX. The green represents long term bonds. Looking at these lines, the first thing you will notice is different patterns. Some will go up more then others while others will just maintain a steady northward increase. But what do the lines mean? On the left, you'll see $100 where everything was equal. If you invested $100 in 1950, then you follow the line that you invested in and you'll see the line end up increasing when it makes it to the right of the page. There are obvious dips in the line which represent negative growth for that investment. 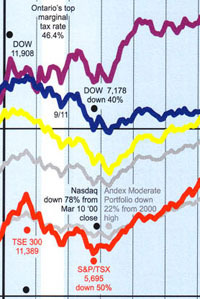 For instance, the image on the right is from the 2001 stock market crash. 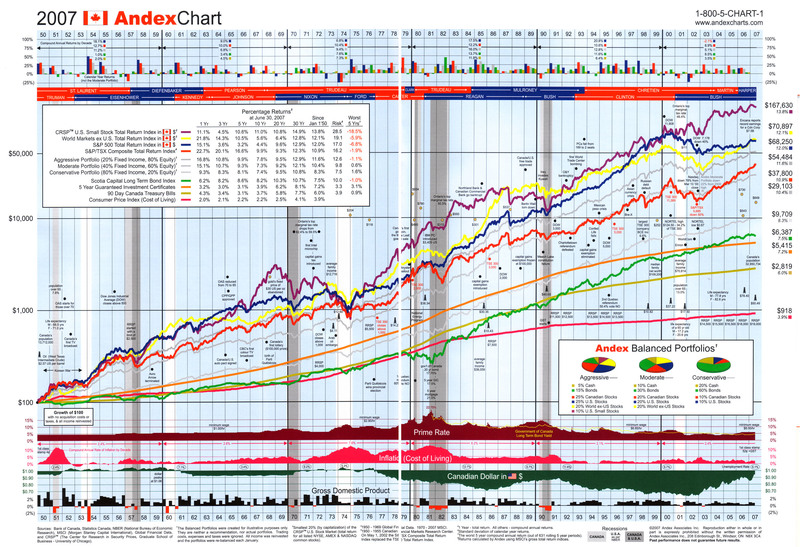 You'll see the purple S&P500 go down, the TSX (orange) goes down and also the World Markets (yellow) decrease. What the images also shows is that the markets end up going back up which is a key thing. 10.9% per year. So a $100 investment in 1950 would give you a hefty sum of $37,800 today. If your young like I am then you're not exactly worrying about retiring next year or the year after. Looking at the andex chart, in the 1970's if you invested $100 then it would not have moved too far up until the end of the 1970's. This would have been one of the slower periods in time but if you look on the Andex chart you can see why as some things are typed in to give you an idea of what was going on. Then we see in the 1980's most of the investments took off except the ones with the most risk. Afterall, if you look at the original Andex Chart, you'll see the money will regain it's value over time. As we are currently in a recession, the chart for this year will have a dip. But as always, we will come out of it with an increase. As for when, who knows. The most important thing being, right now is really an ideal time to invest because it will give you a bigger return when we do come out of this recession. Now I am not saying go out and buy a lot of stocks but I am saying, go out and invest in a mutual fund and let it go from there. Afterall, I am no wizard when it comes to picking stocks. I have had good luck but when it comes to dealing with big bucks, I'll leave that up to my mutual fund manager. To get an andex chart, visit your bank or who ever you deal with for your investments.